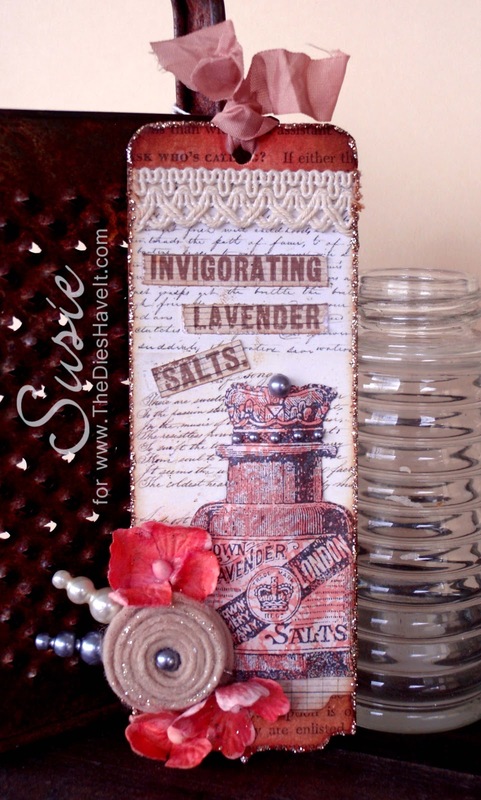 As promised I am back with another project I made as a guest designer for the Antiquated stamp collection at Pink Persimmon. These wonderful stamps are designed by Lisa Pace and I am so thrilled to be able to share some inspiration with you. I started with a die from PaperTrey Ink for the base of my tag. I inked it up using Distress Inks and then added a layer of patterned paper which also needed a bit of inking. After stamping all the images, I cut them each out and applied them to the tag. To finish this up I added lace and seam binding, paper flowers colored with Copic markers and a felt flower cut with a die from MFT Stamps. Right before I called it complete, I added platinum Stickles around the tag and some silvery grey pearls. Yup. Done!! I am so very honored to be a guest designer on the Pink Persimmon site. The Antiquated line is just so charming and that makes it easy to create sweet vintage items. Love them!! I will be back tomorrow with another project to show you. I hope I'll see you then. Love the tag, Susie. You are such a talented lady.